Feel free to download all the parts or put them on your own page (yes please!). Simply click on the links below to read each chapter or download the zipped plain text documents. Link and Zelda are finally with one another again, and their children are safe once more. But after recent events, such as Link's ordeal in Calatia and the kidnap of their son, Ewan, the couple decide it is time to visit an old haunt - Valour Hold. In the company of friends like Nick, Selina, Drake and Aaron it seems like a fine idea, but some of them are still uneasy. 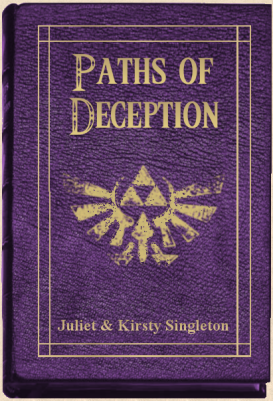 Zelda cannot forget Kaibre Lainge, a man who she might have loved, and she cannot rid herself of the guilt of betraying her husband Link. Something else is worrying her too, but she can't quite place it - and she is not the only one with fears. Mara is still at large, and the faeries take it upon themselves to track down the witch once and for all, and find out just exactly what she is planning. To make matters worse, Queen Seline, ruler of Calatia is found murdered - and the new ruler of Link's homeland is none other than Robert of the Kokiri tribe who still bears his kin a dangerous and potentially destructive grudge. This page was created by Juliet A. Singleton © 2002-2008. All rights reserved.